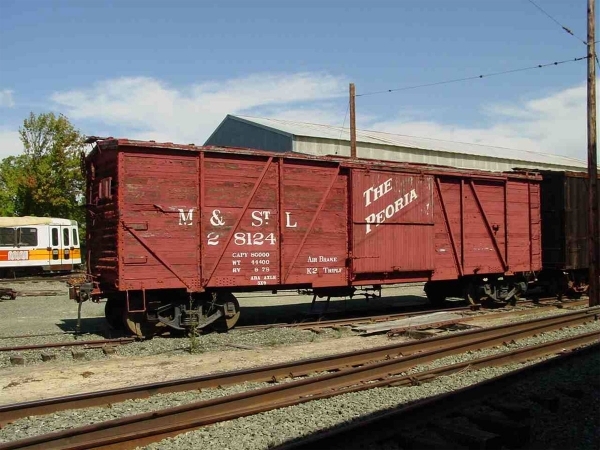 M & St L 28124 is a single sheathed outside braced 40-foot wooden boxcar. The car is a copy of the Fowler design. Minneapolis and St Louis 28124 was built for the Richmond, Fredericksburg and Potomac, as their 2383. It was built in February 1918 by the Pressed Steel Car Company as part of series 2251-2450 (200 cars). This car was sold to the Minneapolis and St Louis where it was numbered 28124 in 1939. M and St L retired the car and sold it to Hyman Michaels Company. It was acquired by the US Navy in 1944, probably to replace equipment destroyed in the Concord Naval Weapons Station explosion that occurred at Port Chicago, California on July 17, 1944. Hyman Michaels’ ownership plates were present on the car when it arrived at the Western Railway Museum. Owners: Minneapolis & St Louis 28124. Richmond, Fredericksburg & Potomac 2383. US Navy. Technical Data: Type, Boxcar, wooden, single sheathed. Builder and date, Pressed Steel Car Company February 1918. Class. Underframe, steel. Ends, steel. Roof, steel. Lightweight. Capacity, 40,000 pounds. Trucks: Truck center. Trucks, Bettendorf. Wheels. Wheelbase. Journals, 5 X 9 plain bearings. Air Brake Equipment: Air brake system, K-2. Brake cylinder. Hand brake, vertical staff. Dimensions: Length, 40’ 6” inside, 41’ 11 1/2” outside. Width. Height. Doors, single sliding side 6’ 6” widened to 8” by Navy. Proposed Future Treatment: Maintain car in good condition. Reduce door width back to 6’ 6”.